I got in the mood last week to play with my embroidery machine a bit. Last post, Summer Winding Down I shared a small zip bag made with my machine. I also decided to make a “name tag” to wear when I go to my Queen Bee’s gatherings. 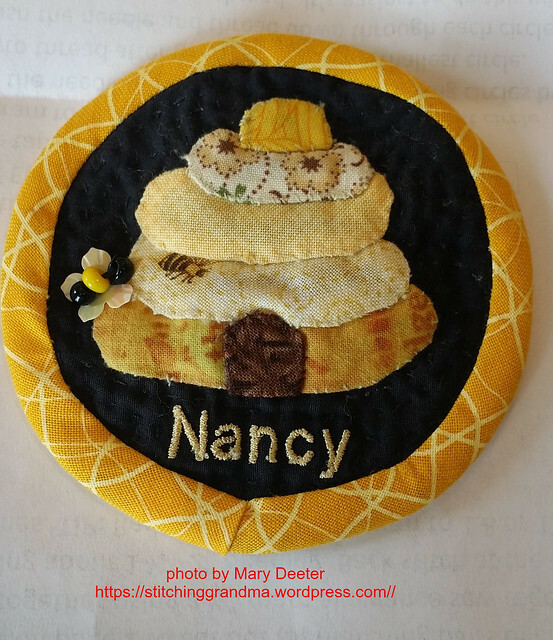 I was inspired last Tuesday by my friend Nancy’s hand made tag. 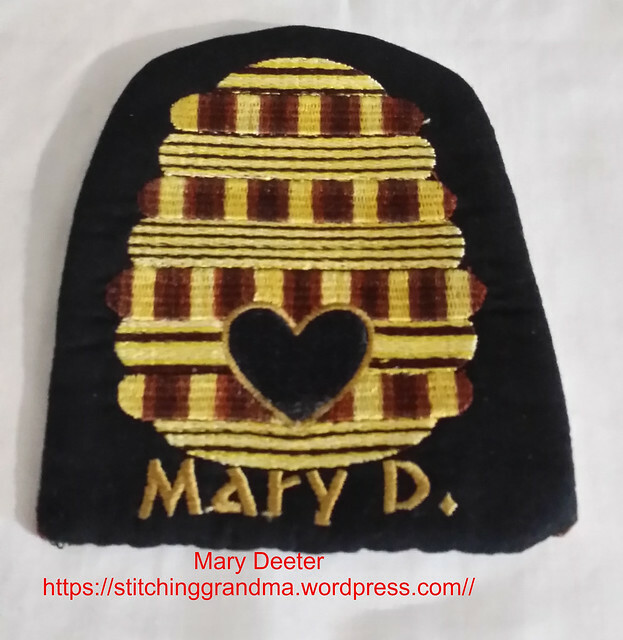 She designed and hand appliqued her bee skep (bee hive) , and used her embroidery machine just for her name. Isn’t the little bee made from beads and a flower petal sweet? 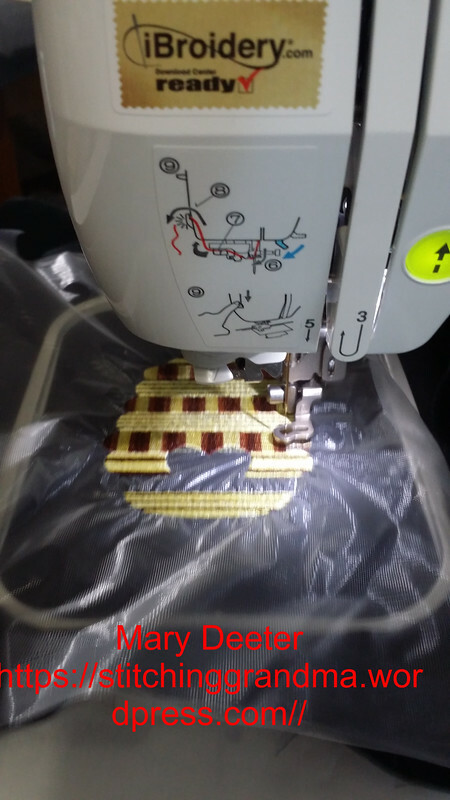 Since I loath sewing by hand, I thought I would keep a watchful eye out for something I could use my embroidery machine to make the tag. I found the perfect design at SewSweetly.com . I do like to keep track of what I used in the various color changes on the color sheet, just in case I want to duplicate or change something on the “next run”. I stitched out the 3.5″ design. The 4″ would not open on my Brother PE500. I am guessing it was bigger than 100 mm, even though it was labeled as a 4×4. I decided to use that wonderful Embroidex variegated thread I was given 2 years ago! Did have to do a little hand stitching after I put a back on the design and close it up at the bottom, but overall I am happy with the outcome. I didn’t have any clasps on hand so I hand stitched a big safety pin on the back to allow me to pin this to my shirt at my next bee. 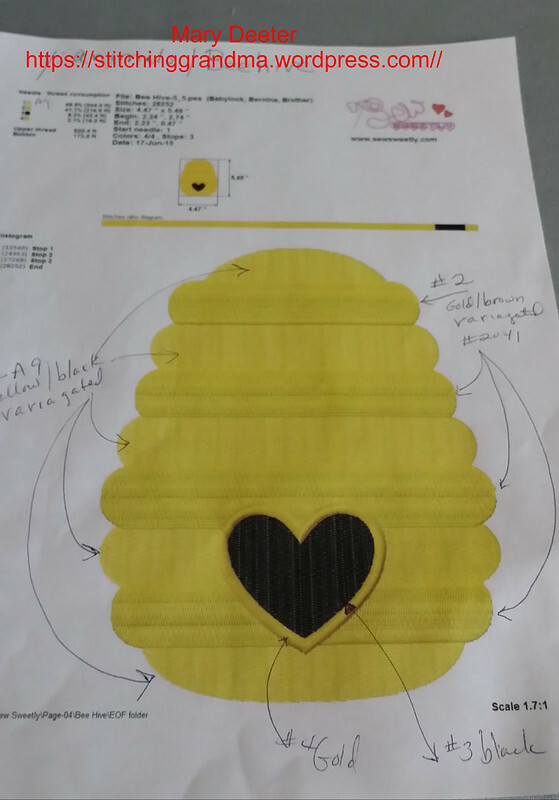 I’m keep my eye open for the perfect bumble bee to attach to this hive! NOTE – I am not affiliated with this website! But have to tell you everything is on sale today. I paid $3 for the design last week, and you can get it today for $0.75. Happy stitching….off for another bike ride!